In a group of young'ns, Lauren feels vulnerable about her place on the tribe. Her best bet for staying alive is if the tribe turns on Patrick and his fail at a social game is definitely helping Lauren's odds. Over on at boring Heroes beach, Ashley is still denying she's in a power couple with JP but doing her hardest to campaign to keep eye-candy-provider JP over can't-open-coconut-wildcard Alan. Healer Cole confides to Jessica that Joe found the Hidden Immunity Idol, which is Cole's form of whispering sweet nothings to his crush. Jessica rewards Cole with a kiss on the cheek, but later gets annoyed when Cole continues to reveal the powerful Idol secret to Desi and Roark as part of a master plan to blindside Joe at a future Tribal Council. 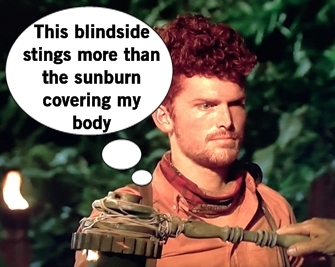 The Hustlers lose the Immunity Challenge largely to due Patrick's poor performance to accurately throw sandbags at blocks, allowing the Heroes and Healers to get to the stacking portion (and victory) sooner. Veteran outfielder Lauren is particularly annoyed she didn't get to throw and have her A League of Their Own star moment. Always the Kit, never the Dottie. Devon, Ryan, and Ali are at a crossroads of who to keep because alleged challenge strength Patrick lost for them and Lauren's a bit of an outsider. Talk turns to the merge but maybe they should be thinking about an obvious swap first. Tribal Council time! Lauren isn't being coy about her feelings about Patrick, laying into him for being out for himself and not the team. Patrick brings up his conversation with Lauren on the beach and she turns that around on him too, talking about him smirking and fake comforting her. But then Lauren talks about not believing a redhead in her life and that seems a biiiiit extreme. The tribe seems to be in agreement that the vote will be about creating the best chemistry for the tribe but how they'll fit into the merge. Patrick thinks he'll be valuable at a merge because he's good at making friends, but Ali points out he hasn't made friends with Lauren so it might not be his best asset. Patrick hopes he can grow but unfortunately he'll be growing on some really cool pre-merge boot trip as the Hustlers vote Patrick out of the tribe.